Highly Sensitive (HSP) – what does that even mean? And could HSP describe you? Around 15%-20% of the population could be described as having the trait of high sensitivity (known as HSP, ‘Highly Sensitive Person’). It’s not a mental illness or disorder in any way. It seems simply to be a genetically heritable trait, something you’re either born with, or you’re not. (High sensitivity is apparently even seen in animals, having been observed in individuals in over 100 species). Is ‘highly sensitive’ the same as ‘over-sensitive’ or ‘hyper-sensitive’? Sometimes people confuse the HSP trait with being ‘over-sensitive’ and overreacting emotionally. But in fact these are two different things. Someone who overreacts or behaves over-sensitively to (for example) something you say, is more likely to have something else going on in their emotional background. This could be any of the following: a history of trauma, growing up in a climate of racism/sexism etc, problems with how they were parented, attachment difficulties, being bullied; or something else. Of course, a highly sensitive person can also have the kind of difficulties I’ve just described. It’s just that not all HSP’s have a lot of trauma or insecurity in their background (just as with non-HSP’s). What are the characteristics of a Highly Sensitive Person? One way to summarise the main aspects of the HSP trait is to use the acronym DOES. Let’s unpick each of those a little (and as a side note: there is a growing body of scientific evidence for each of these elements). Everyone processes things that they experience or encounter. However, HSP’s tend to process on a deeper level, with greater intensity, and sometimes over a longer timescale, than non-HSP’s. HSP’s get stressed from too much stimulation more readily than do non-HSP’s. Noticing multiple details of social cues, complicated ideas, interactions, noises, smells, etc, gets exhausting for an HSP if it goes on for too long at too high an intensity. So after an intense day at work, they may need to have a quiet evening, rather than to unwind by going to a party or see an exciting movie. Note: There is a subtype of HSP called the ‘high sensation-seeking HSP‘. These people seek (and need) thrilling, high-sensation experiences; but they too can get easily over-stimulated, so this needs to be carefully managed. HSP’s may respond more deeply than non-HSP’s to emotional cues. Sometimes this is obvious: an HSP may cry readily, and express joy unreservedly. However, it’s been my experience that this emotional responsivity is not always evident to an outside observer; and indeed an HSP may have unconsciously learned to try to minimise their emotional responses even to themselves. Scientific studies involving brain imaging have shown that an HSP’s brain and body can have heightened reactions even when not as clearly seen from the outside. This seems to apply particularly to positive cues (there’s a strong reaction to negative cues too, but that tends to apply to most people, rather than being more of an HSP thing). If you’re an HSP you probably tend to be particularly empathic, picking up and being affected by someone else’s emotion almost as if you are feeling it yourself. Again, scientific studies bear this out. This is the part that most HSP’s are particularly aware of in themselves. HSP’s notice the subtle layers to things. They may instinctively pick up on a great many of the finer details of what’s going on in an interaction, including non-verbal cues, prosody (tone of voice), underlying meanings, and people’s moods. This can inform their intuition and affect their own emotions. But when an HSP is worn-out, stressed and over-stimulated? Then, they may be able to take in very little, because they feel so overwhelmed with their need to get some rest and down-time. How can I tell if I’m an HSP? There’s a test you can take, for free, here. It’s not a diagnosis (HSP is not a disorder), it’s more of a guide which may help you. What kinds of therapy suit HSP’s? And what about online therapy for HSP? I believe that Highly Sensitive people do better with a therapist or counsellor who is either (a) an HSP themselves, or (b) is knowledgeable about the trait and is able to tailor the therapy or counselling accordingly. The HSP trait is not widely known about (although this is changing) so you may find that your therapist or counsellor is unaware of it. However, many therapists and counsellors already have a wonderful capacity for empathy and attunement, so don’t automatically rule them out as a good fit for your needs. Online therapy can work well for many HSP’s, although it doesn’t suit everybody. It’s a good idea to make sure your therapist has additional training for working online (in the UK, there’s a Diploma in Online Therapy) and, as with face-to-face therapists, ask them if they have an understanding of the HSP trait. Can High Sensitivity be removed? Just to be clear: therapy or counselling for a highly sensitive person is not about removing the trait (which would be impossible). Instead, it’s about helping you to adjust better to your own needs, and understand yourself better; and/or processing your difficulties (whether that’s the effects of trauma, issues such as anxiety or depression, relationship concerns, a significant loss, or whatever). Therapy can also help if you also have a tendency to be ‘hyper-sensitive’ or to ‘overreact’ (see above). Is ‘Highly Sensitive’ another way of saying ‘Introvert’ or ‘Shy’? No. 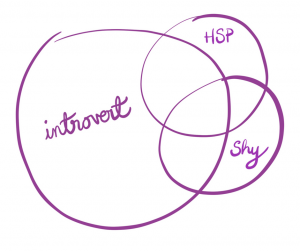 Although the majority of HSP’s are introverts, 30% are extroverts. 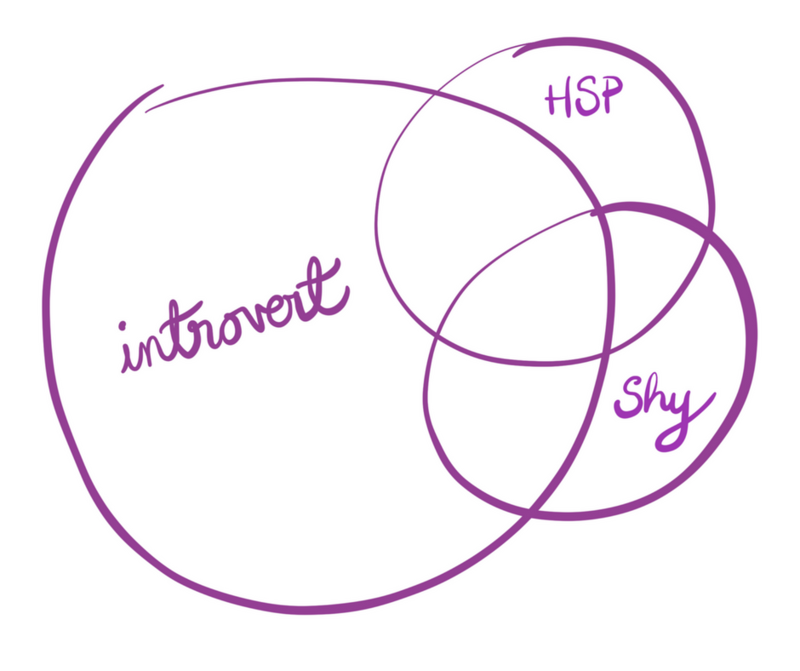 And there are many introverts who don’t meet the criteria for HSP. And shyness? Shyness is a learned characteristic, not an inbuilt genetically-based trait. Is the trait only found in females? No. It’s found across genders. Some males have learned more skilful ways of hiding their HSP qualities, as many cultures do not value the strengths associated with sensitivity. Is it better to be an HSP or a non-HSP? Neither! There are pluses and minuses either way. Anyhow, it’s not something you get to choose. So if you are an HSP, don’t try and fight it. Instead, learn as much as you can about the trait. This should help you figure out ways that you can adapt your daily life as well as possible. Learning about high sensitivity can also help you educate your family and friends, and raise their awareness about what works and doesn’t work when they interact with you. A lot of my other blog posts are particularly relevant to HSP’s (scroll down to the bottom of this page). I’m Emma Cameron, MA, and I offer online counselling for HSP’s in the UK and around the world (excluding USA and Canada, for licensing reasons). I also work with Highly Sensitive Persons in Integrative Arts Psychotherapy and Counselling for HSP in Colchester, Essex, UK. Contact me today for more details and to discuss what you are looking for. I hope you have found this page helpful as a starting point to understanding the trait of High Sensitivity.